This room concept was created by Swaantje Nijkamp, Linde Ex and Ella Gil and designed by Elwin van Heyningen. 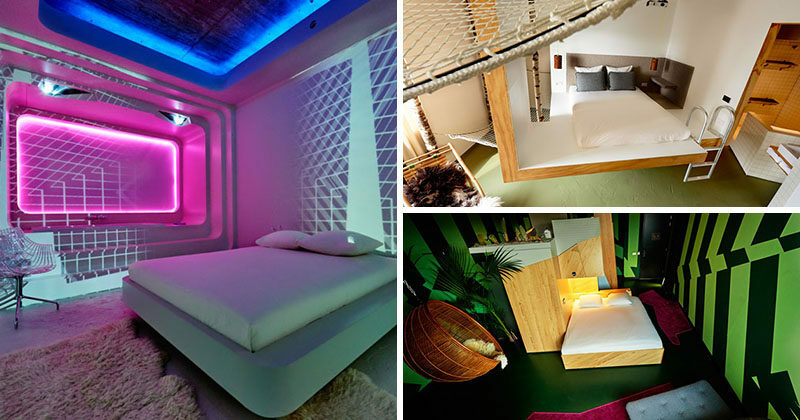 The futuristic room lights up in a number of different ways ranging from a simple illuminated bed to a full on neon party. The room also features an interactive map on the wall that allows you to select a point on it and have footage from that place be projected onto your walls. As its name suggests, this room, designed by Gabor Disberg, was created for those who love nature. The bed sits in a treehouse or cabin-like structure, there’s a hammock with cozy blankets perfect for hanging out in, and plants in the shower create the feeling of actually being in nature without the risk of bugs or bad weather. 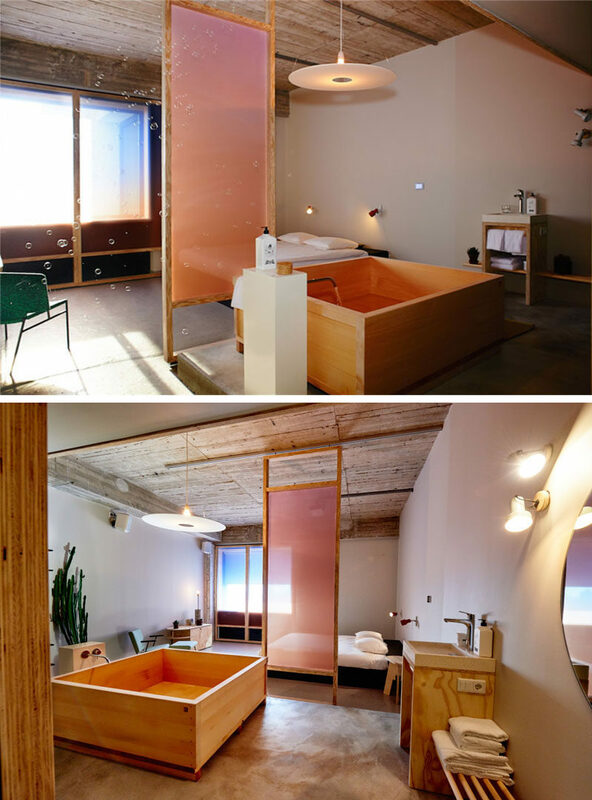 A Japanese tub sits in the middle of this room, designed by Hanna Maring, and is separated from the living and sleeping spaces only by a sliding pink screen. The open and minimal room encourages guests to relax and unwind in the spa-like space after long days out exploring the city. Designed by Jos Blom and Jasper Eustace, this room was created for those who love adventure. Plants are scattered throughout the room and the bathtub is found at the top of a narrow staircase designed to mimic the climb up a mountain. Even the shower contributes to the adventurous feel of the room as it recreates the feeling of standing under a waterfall. This room was designed with music lovers in mind. Remco Gonggrijp used geometic shapes, included surround sound, as well as a collection of vinyl, CDs, and cassettes to allow guests to feel like DJs as they lay in bed, lounge in the bath, or dance around the room. In an attempt to include one of the most quintessentially Dutch elements, Thijs van Oostveen created a room that incorporates bike elements into every detail. The walls are covered in white bicycles, the bed is in a bakfiets (Dutch bike cart), and the room comes with two white bikes that you can use during your stay to explore the city. 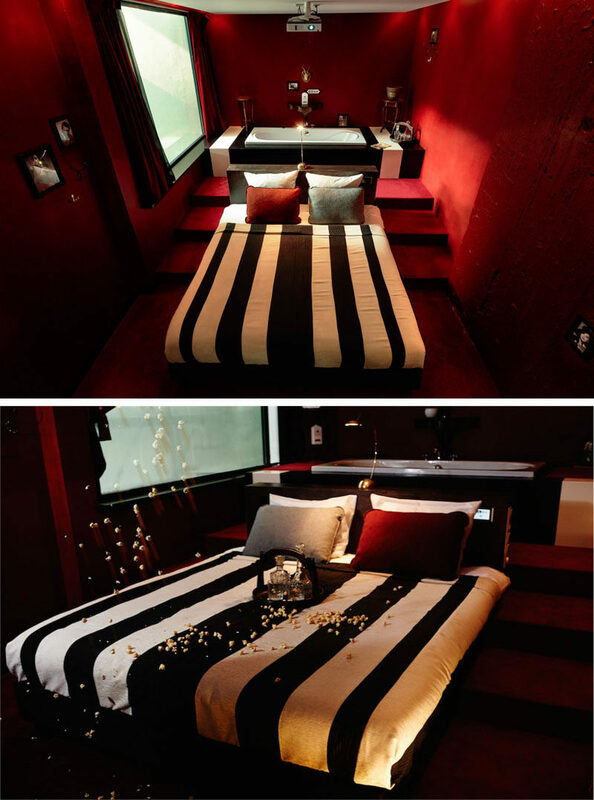 This room, designed by Maja Markovic, uses black, white, and red to create an intimate and cinematic atmosphere inspired by the Electric Cinema in London. You can connect your laptop to a device in the room and have your favorite movies projected onto the wall and watch them from anywhere in the room, including from the bathtub behind the king size bed. Full of temptation, this room designed by Rosa Lisa Winkel, features a suspended bed, a bath on a podium, dual showers, and moody lighting that all contribute to the room’s mysterious and romantic atmosphere.